“What does it mean that Jesus is risen? It means that the love of God is stronger than evil and death itself; it means that the love of God can transform our lives and let those desert places in our hearts bloom…. to bring them the light and joy of our faith. “Dear brothers and sisters in Rome and throughout the world, Happy Easter! Happy Easter! 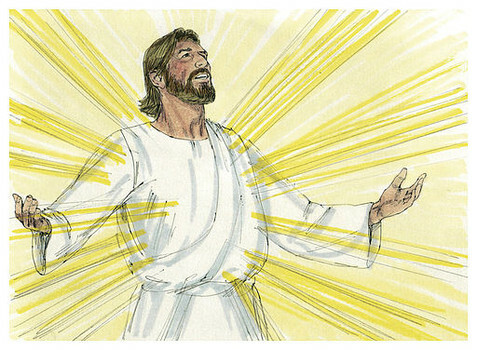 Most of all, I would like it to enter every heart, for it is there that God wants to sow this Good News: Jesus is risen, there is hope for you, you are no longer in the power of sin, of evil! Love has triumphed, mercy has been victorious!…. What does it mean that Jesus is risen? It means that the love of God is stronger than evil and death itself; it means that the love of God can transform our lives and let those desert places in our hearts bloom. The love God can do this! This same love for which the Son of God became man and followed the way of humility and self-giving to the very end, down to hell — to the abyss of separation from God — this same merciful love has flooded with light the dead body of Jesus, has transfigured it, has made it pass into eternal life. Jesus did not return to his former life, to earthly life, but entered into the glorious life of God and he entered there with our humanity, opening us to a future of hope…. Dear brothers and sisters, Christ died and rose once for all, and for everyone, but the power of the Resurrection, this passover from slavery to evil to the freedom of goodness, must be accomplished in every age, in our concrete existence, in our everyday lives. How many deserts, even today, do human beings need to cross! Above all, the desert within, when we have no love for God or neighbour, when we fail to realize that we are guardians of all that the Creator has given us and continues to give us. God’s mercy can make even the driest land become a garden…. So this is the invitation which I address to everyone: Let us accept the grace of Christ’s Resurrection! Let us be renewed by God’s mercy, let us be loved by Jesus, let us enable the power of his love to transform our lives too; and let us become agents of this mercy, channels through which God can water the earth, protect all creation and make justice and peace flourish…. “The central Christian belief is that Christ’s death has somehow put us right with God and gives us a fresh start. Theories as to how it did this are another matter. A man can eat his dinner without understanding exactly how food nourishes him. A man can accept what Christ has done without knowing how it works: indeed he certainly would not know how it works until he has accepted it. “A couple of years ago, talking to a Puertan Rican monsignor with an acute gift for simplicity, I found myself embarrassedly asking if he could explain to me the core meaning of Christianity. He urged me not to feel bad, since about 95 percent of Christians do not understand Christianity either…. On the evening of that first Good Friday, he went on, this is how it was with Jesus. But then, forty hours later, something happened that would change everything. Jesus came back to life. Let us be clear, he emphasised, Jesus began to breathe again, grew warm, started to move, re-engaged with reality, became interested in things around Him. Having been dead, He became, once again, as alive as we are. This, the monsignor told me, is both the meaning of the Resurrection and the central idea of Christianity: that death has no dominion, that beyond the end there is a new beginning. Christianity, he said, is the announcement to the world of the death of death…. In a life spent in Catholic churches and schools, reading Catholic periodicals, nobody had ever succeeded in communicating to me that the central message of Christianity is about hope beyond human imagining. “For most, it seems, resurrection is just about the future. If so, they miss the point. Jesus is risen, not will be risen. We too can ask for Jesus’ help to be resurrected daily. On waking, ask for resurrection of some part of our lives. Each of us are different: it might be a relationship with a family member, for example. On Holy Thursday Jesus put thoughts on his prayers. On Good Friday he put it into action, into deeds. On Saturday, so often overlooked, he was entombed. Resurrection does not happen instantly. he keeps nothing for himself, not even life. so as to be with us always, to dwell among us. but with absolute trust commends himself to the Father. in perfect union with his will, to demonstrate his love for us…. What is the meaning of all this for us? It means that this is my, your and our road too. especially those who are the most distant, those who are forgotten, those who are most in need of understanding, comfort and help. Living Holy Week means entering ever more deeply into the logic of God, into the logic of the Cross, which is not primarily that of suffering and death, but rather that of love and of the gift of self which brings life. It means entering into the logic of the Gospel. to come out of ourselves, out of a dreary way of living faith that has become a habit, out of the temptation to withdraw into our own plans which end by shutting out God’s creative action…. the one that has strayed the furthest. and Jesus came out of himself for all of us…. what a pity so many parishes are closed!